Die nächste Mission in Season 4 ist draussen: „On a Silver Platter„! A year ago your fixer’s daughter was killed by the Mayan Cutter copycat. He always suspected that someone else was pulling the strings, someone highly placed. Now he believes he has proof, but that someone isn’t going down without a fight. The stakes are higher than ever aand someone’s trying to stop you before you even start! Are you ready to serve up a side of revenge? Das neuste Abenteuer der Shadowrun Missions Reihe führt die Geschichte der vorherigen Abenteuer fort, die sich um den Kampf zwischen dem Ork Untergrund und der Stadt Seattle um mehr Metamenschenrechte bündelt. Diesmal ist es die persönliche Trauer eines Vaters, die sich mit diesem Kampf vermischt und er sucht die Runner auf, um eine Fehde zu beenden. Wie weit werden sie gehen? Die Spieler haben die Chance, die laufende Handlungsreihe zu beeinflussen und die Zukunft von Seattle in der Sechsten Welt zu formen. Als kleinen Bonus enthält das Paket zudem eine Vorgeschichte von einer Convention aus 2010 genannt „Copycat Killer“. Bisher war diese Story jedoch nicht für die Öffentlichkeit erhältlich: das ändert sich jetzt. Diese Mission enthält zusätzlich zum normalen Missionsband auch die Copycat Killer Geschichte, ohne extra Kosten! For three years the Mayan Cutter terrorized the metahumans of Seattle and many point to their inability to stop him as the reason Lone Star lost it’s Seattle contract. Shortly after Knight Errant took over, the killings stopped and the Tin Men took credit for bringing him down. But now the killings have started again. Is it a copycat or is it the real deal? You’ll have the chance to find out when a grief-stricken Mr. Johnson calls you to track him down so he can get revenge. Also zwei zum Preis von einem: da heisst es nur zuschlagen!! Das Paket ist wie üblich auf DrivethruRPG zu kaufen. Shadowrun Missions: Rally Cry ist da! Eine neue Mission der aktuellen Seattle Reihe ist bei Battleshop oder DriveThruRPG erhältlich: Rally Cry! Der Orkuntergrund will ein anerkannter Stadtteil werden, die Chancen und Risiken steigen. Das bedeutet viel Arbeit für Runner. Whoever wins the war for the future of the Ork Underground is not going to leave a single weapon holstered. From waging outright violence to employing political subterfuge, both sides in the struggle are willing to use any tactics they can dream of to advance their cause. Anti-metahuman sentiment has long been a hot-button issue in Seattle, and some members of the Ork Rights Committee have decided to expose one of Governor Brackhaven’s cronies for the racist they believe him to be. The only trouble is, people with a high public profile are usually very careful about keeping up appearances. If the ORC is going to support their accusations of racism, they may need some help in getting—or manufacturing—the evidence they need. That, of course, is where shadowrunners come in. 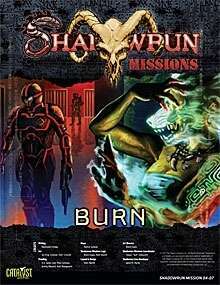 Falls Ihr für eure nächste Shadowrun Runde ein neues Abenteuer sucht: die nächste Episode der Seattle Missions Reihe ist soeben erschienen. SRM 04-02: Extraction wurde soeben veröffentlicht und ist unter anderem bei Drivethrurpg zu kriegen. Parker Acson is a hot property. Horizon has just hired him, but they’re the only ones who want him. Acson has gotten the attention of plenty of players in the magical arena, and several of them are interested in getting a piece of him. The runners have been hired to extract Acson by a mysterious Mr. Johnson, and they’re going to have to move quickly to get him out safely. There is plenty of competition out there, and not all of them are interested in Acson staying alive and intact. Ein weiteres Schmankerl ist die PDF-Neuauflage des Klassikers Dreamchipper (ebenfalls bei Drivethrurpg erhältlich). In Shadowrun, the rampant substances of the 19th and 20th centuries are now as archaic as 8-track audio tapes. Now the escape of choice is the BTL, or Better Than Life chip. Plug it in and all physical pleasures, desires, and hopes suddenly pale by comparison. Some ‘experimental’ chips are missing, and you’ve been hired to find them. But an investigation of simple theft is turning into a grisly trail that seems to have no rhyme or reason. Now you are beginning to wonder … can these chips program someone to be a serial killer? Catalyst hat auf seiner Shadowrun4 Homepage einige Wallpapers zu den letzten Shadowrun Missions veröffentlicht. Ihr könnt diese dort runterladen. Die Wallpaper sind in zwei Größen verfügbar: 1680×1050 und 1600×1200 Pixel. Die neuste Shadowrun Missions Episode „Hiding in the Dark“ ist ab sofort als PDF erhältlich. Wie üblich könnt Ihr das PDF auf Battleshop oder DriveThruRPG käuflich erwerben. Wer Shadowrun Missions nicht kennt: es handelt sich dabei um von Catalyst bereitgestellte Abenteuer Kampagnen speziell für Konventions und Spielemessen. Aber auch normale Spielrunden können auf diese zurückgreifen. Criminals in the Underground don’t go down easy, though, and shadowrunners are going to have to use all their skills to track Junior down. When they find him, they might discover that their task isn’t quite as straightforward as they may have thought.